Word on the street is true, Four Seasons Hotel Kuala Lumpur has just opened its doors to luxury accommodation and even more decadent suites. Located in the heart of Kuala Lumpur in one of the city’s magnificent skyscrapers, you, as a pampered VIP guest have the option of choosing from one of 209 rooms and suites. This new addition to the Four Seasons family does not hold back, but rather shines with brilliance from all its luxurious interior designs and dreamy rooms. This hotel may however, make you wish you booked 365 days, but perhaps that is what makes this new addition so special as it offers its guests the true experience of a fine stay, really hitting the target on luxury hotels. Step inside the Trigona bar and watch the bartender work his magic on a Martini composed of locally sourced ingredients made by one of Four Seasons professional mixologists, then head to the Yun House for a savory and rather wonderful experience for your palette as the trained chefs turn your dinner into more than just a delicious meal, but a work of art. From presentation to the ingredients coming together to create an artfully balanced cuisine with all the right ingredients to create, well, perfection! But wait, what good is a hotel without a little sweetness? 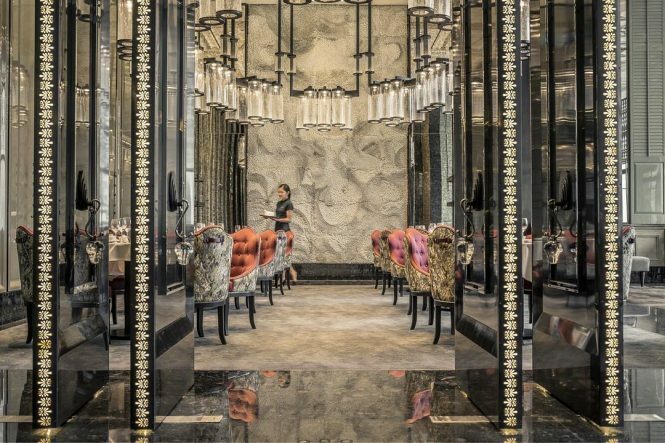 Well the Four Seasons Hotel Kuala Lumpur has thought of that too, with a large sweets bar named Decadent, with pastry chefs working on-the-spot to make many tasty treats ranging from delicate pastries, fine cakes, chocolate brittle and gelati. Full of delicious and wonderful surprises, it really is the “cherry on top” of this perfect hotel! If you’re planning your next journey to Malaysia, give The Luxury Travel Agency a shout! Because by booking this property with us, as with many other 5 Star properties, we can offer you several perks and amenities. Some of which include complimentary daily breakfast at the restaurant/In-room, spa credits, upgrades to the next higher category (based on availability), custom welcome amenities and VIP service. Oh, and we almost forgot; from August 01 to December 31, 2018, you will receive a relaxing 45-minute massage, complimentary of Four Seasons Preferred Partners (based on availability. To learn more about the benefits and, no pun intended, luxury of booking with The Luxury Travel Agency for your next trip, drop us a line or WhatsApp us at +1 647 551 5460, or shoot us an email at , and one of our experienced and knowledgeable travel experts will be happy to guide you to the luxury trip you have always wanted.